Royal Mauian #212 LUXURY OCEANFRONT condominium on the SECOND floor (Unit #212) is 30 feet from the ocean at the CENTER of Royal Mauian Resort allowing you to enjoy the 180 degree panoramic ocean view of the Pacific Ocean. A few steps from the Royal Mauian complex are two beautiful white sand beaches, Kamaole Beach Parks I and II. The condo is located within easy walking distance to both life-guarded beaches and to many restaurants and shops. Guests can also enjoy snorkeling right out front of the Royal Mauian Resort. Royal Mauian 212 was purchased by the Gaertner family in 2008, and we’ve spared no expense to make our guests feel comfortable and pampered. You’re sure to enjoy the keyless entry, zoned A/C, granite counter tops, travertine and bamboo flooring, urban Hawaiian décor and fully equipped kitchen. RM 212 boasts 2 completely renovated bathrooms which include NEW quartz counter tops, sapele wood vanities, porcelain/glass tiled showers, new toilets and sinks, and for your comfort, travertine inset towel bars for lots of room to hang wet towels. The private lanai is a great place to catch the resident turtles feeding in the mornings, watch the whales (winter months) and enjoy the warm Hawaiian breezes. The Royal Mauian complex has a heated ocean front fresh water pool, and chaise lounge chairs for our guests to enjoy. The rooftop patio featuring gas BBQ's and full kitchen facilities is a great place to take in the beautiful Maui sunsets. Make sure to bring your camera to dinner! You are sure to enjoy the luxury of this condo with it's updated décor, many amenities and superb location in sunny Kihei, HI. PLEASE CHECK AVAILABILITY CALENDAR and email to book your vacation in our beautiful ocean front condo. We update the calendar regularly to keep it as accurate as possible. 5 night minimum stay as per condo bylaws not including holidays. 10 day minimum stay during holiday seasons. * We do not provide boogie boards or snorkel gear, however there are rental shops right across the street from the Royal Mauian. A REFUNDABLE damage deposit of $500 USD is required to confirm your reservation. The $500 deposit is taken in addition to the nightly rate plus tax and will be refunded in a timely manner (within 14 days) after check out once the unit has been inspected. RENT (nightly rate plus tax) is due 90 days prior to the scheduled arrival date. Free parking out front of resort for ONE car per unit. We are the Gaertner family. Paul works as an Emergency Room Physician and Laura is a stay at home Mom to Gabrielle (19) and Samuel (15). We live in beautiful British Columbia, Canada. We LOVE the island of Maui! We have vacationed on Maui, Oahu, Kauai and the Big Island of Hawaii, and we found Maui fit our family the best. We enjoy the relaxed island lifestyle as well as the shopping, restaurants and outdoor activities Maui has to offer. Our favorite part of Maui is Kihei. We love that Kihei is warm, dry and sunny as opposed to the rainier north side of Maui. This is why we chose to purchase a property in Kihei and we believe the Royal Mauian is located in the best possible place to enjoy Maui to its fullest. We love Royal Mauian 212 b/c of the full ocean view from it's central location in the building, it's short walking distance to 2 great beaches Kamaole I and II (great for kids), and close to shopping and restaurants. We've done our best to make Royal Mauian #212 luxurious and comfortable yet functional. Royal Mauian 212 has been fully renovated. You will enjoy keyless entry, zoned AC, as well as the up to date kitchen and bathrooms. We have gone to great lengths to try and think of everything our guests could need while staying in our condo. We placed TV's in the living room and both bedrooms with DVD players for wifi connection (YouTube, Netflix, etc.) We keep the condo maintained and the bedding clean and fresh. Both bathrooms are fully renovated and up to date. Our guests are sure to enjoy their luxurious finishes and Hawaiian flair. The roof top BBQ area and patio is also fantastic and the view is so spectacular it's hard to put it into words. You'll just have to go and experience it for yourself! We love that from the Royal Mauian one can walk to the beach, swim and snorkel right out front of the building or just laze on a lounge chair on the ocean's edge. The heated ocean front pool is also very convenient if one would like a break from the salt and sand of the ocean/beach. If you don't enjoy snorkeling or water sports, you can still enjoy watching the turtles and the whales (Nov-May) as you sit on the 100 square foot lanai with your morning cup of coffee. 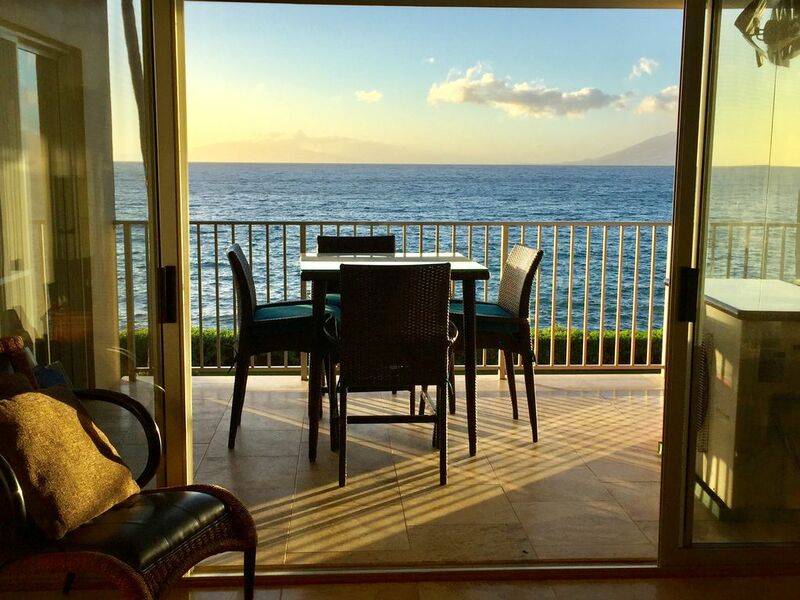 The lanai faces west so is shaded during most of the day but from the lanai, one can enjoy the spectacular Maui sunset every evening. Within minutes of the condo are great restaurants to eat out - Mexican, Thai, and American cuisine amongst many others. And who can forget SHAVE ICE shop or Cinnamon Bun Place right across the street! Or if you decide to eat in, there are grocery stores close by to purchase everything you need for quick lunches or to prepare dinner cooked in the gourmet kitchen or up on the roof top BBQ and patio area. It makes for a relaxing vacation amidst all the amenities that make this luxury condo and location a great place to come year after year. New quartz counters, under mount sinks, new toilets, porcelain/glass shower in master, new tub and porcelain surround in guest bath. Travertine inset towel bars and robe hook. Royal Mauian is located directly oceanfront between Kamaole Beach Parks 1 and 2. Wonderful grassy area for Royal Mauian guests to enjoy. Chaise lounges for guests to enjoy poolside or on grass. Directly on the ocean with fantastic views from lanai, living room/kitchen and master bedroom. Each room has Individually zoned AC meaning each room has an AC unit and can be custom controlled. Lounge chairs out front (ocean front) for Royal Mauian guests. Roof top patio available to our guests. BBQ's and tables/chairs available for our guests. Beautiful sunsets from this location. Surf Board storage downstairs. No surf boards allowed in unit. Rental of boogie boards and snorkel equipment across the street from Royal Mauian. We do not provide water sport gear but easy rental. The condo is not really set up to accommodate wheel chairs. This place is amazing! If you want the most comfortable and equipped place to stay on the water in Kihei you want to take a long look at this place. It does not feel like a rental unit, it feels like a home. The kitchen is very well set up and the whole unit is super comfortable. Laura is an amazing host and very easy to contact. We loved our stay here!! The right accommodations can make a good vacation even better. We had a great time staying in this condo: the views from the living room and bedroom were second to none. You couldn't forget that you were in Maui, even for a minute. The unit was clean and well equipped. We found the beds very comfortable. We especially appreciated the proximity to Kamaole 1: the waves were gentle enough for our kids most days and there was great snorkeling just off the rocks. One small tip: the second bedroom got some noise from traffic, other guests and (especially) birds in the trees outside. No fault of the hosts, just the nature of the design. You might want to pack earplugs for nighttime. We really loved this condo. It’s a pretty condo with a fantastic view. We could walk to almost everything we needed. There is a beach on both sides of the building. There are various restaurants and convenience stores within walking distance. I really appreciated having a health food grocery store right across the street. I wouldn’t hesitate to rent this condo again. Great location, right on the beach and across the street from the best natural grocery store, very good restaurants and surf shops. Thank you for the great review! And we agree, Hawaiian Moons Natural Foods is a great grocery store across the street! Glad you found it! Mahalo for staying with us! Our stay in this condo was amazing! The view is stunning and the condo is very comfy for 2 people. The turtles right there on your doorstep is an added bonus. Thank you Laura for a wonderful stay - we will be back for sure. Thank you so much for your review! You are the dream guest! We would love to have you back any time! Mahalo! This was our 5th trip to Kihei. We stayed all over the island this time and spent our last days in this condo. Overall we had a great time! Laura was very easy to communicate with and quick to respond to messages. There are beach chairs, beach towels, umbrella, boogie boards, and snorkeling gear. The kitchen was fully stocked. They do not supply laundry detergent, so if the last renters didn’t leave any behind you will have to buy your own. We felt the condo could have been cleaner, especially the showers and door jambs. The bed was also very firm, so be aware of that. Kihei is a busy area anyway but this area felt particularly busy because of its location between Kam 1 and Kam 2. We received our refund of the deposit in a timely manner. Overall, a nice place. Not my favorite spot in Kihei, but if you don’t mind noise you’ll be okay. Thank you for submitting a review of our property. I am happy to address a couple of your concerns. As for the laundry detergent comment, you had emailed regarding using the powdered laundry detergent that was already there so I am a bit confused as to your poor review. Many guests do choose to buy their own as they have sensitive skin, etc which is completely fine, however we only ask it be HE because the washer is a high efficiency full-size washer. So I assume the powdered detergent there was not to your liking but WAS in fact in the unit. In regards to the bed, we were completely unaware you found it too firm. Had we known you were unhappy we would have done our very best to make it comfortable for you. You will be happy to know that we replaced the bed in the master bedroom with a brand new high end quality Cal King mattress and box spring (medium firm). This was done on November 13, 2018 and at the same time, we replaced the master bedroom TV with a brand new one. I am sorry you found the unit to collect some dirt/sand. Being 30 feet from the ocean and between 2 sandy beaches, with trade winds coming through the lanai doors and windows, it can get a bit sandy in the nooks and crannies. The showers have to manage with a lot of sandy toes getting washed off after a day at the beach. However, a clean unit is so important to us so we have noted your concerns and will mention it to our housekeepers. We also supply a broom and vacuum for those guests who wish to sweep up the sand that can track in. The beaches on either side of the Royal Mauian are so lovely that it can get busy, however we’ve been going there every year for over a decade and have never found it overly busy/noisy. We obviously can’t control that, however it all depends on your personal preference and expectation. We are pleased you found the unit stocked with everything you needed for a pleasant stay in our condo. We hope you had a good vacation in Maui. CANCELLATION: There is a $200 cancellation fee if reservation is cancelled 30 days or more from arrival date. If reservation is cancelled within 30 days of arrival there is no refund. If the unit can be re-rented the balance or pro-rated balance may be refunded. Holiday stays of more than 10 days must cancel 90 days in advance. Damage Deposit of $500 is due at the time of booking and is in addition to the nightly rate plus tax. The quoted nightly rate plus tax in it's entirety is due 90 days before check in. This is separate from the damage deposit. Cleaning fee of $170 is in addition to the nightly rate, deposit and taxes. All fees in USD. Once owner has accepted a guest's request, guest will be emailed a detailed rental agreement. Please send address with reservation requests.